Amazing Spider-Man #375 and How Do You Solve a Problem Like Venom? 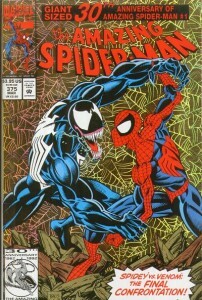 Home » Random Runs of Spidey • Remembrance of Comics Past » Amazing Spider-Man #375 and How Do You Solve a Problem Like Venom? People who follow my Gimmick or Good exploits at the Comics Should Be Good blog should know that I’m no stranger to the foil/embossed/chromium/polybagged comics of yesteryear. And yet, the gold, foil-covered Amazing Spider-Man #375 (the “30th anniversary of Amazing Spider-Man #1!!! ), holds a special place in my heart among the gimmicky goodness that was Marvel comics in the 1990s. As for how I came into possession of ASM #375, while it’s definitely not the first Spider-Man comic to sport a gimmick cover, unless my memory is failing me, I’m fairly certain it’s the first Spider-Man gimmick comic that I ever picked up as a teenager. Despite the fact that I had been buying Spider-Man comics since the late 1980s, as I’ve mentioned in other posts, I did dilly-dally with picking up other superhero titles before deciding to dedicate all of my time, energy and resources to Spider-Man around 1993-94. As such, I remember going to my local comic book shop around the time Amazing Spider-Man 390-something was released, and then scouring the back issue boxes for some additional Spidey gold to mine from the past few years. And in that box, I found some literal gold. Like a lot of buyers in the early-90s, I was immediately drawn in by ASM #375’s gold foil cover. And of course, the larger-than-life visual of Mark Bagley’s Venom (who most of you should know at this point was the first major villain introduced during my early years of reading Spider-Man). I didn’t mention this in my post last week, but as a result of the 90s-ification of this arc, I read ASM #375 a good year or two before I finally found ASM #374. I can’t honestly say reading this two-parter out of sequence did any long-term damage to my appreciation for the story, but I thought I’d share this little bit of Chasing Amazing trivia with you, before talking some more specifics about the comic itself. ASM #375 marks a clear “line in the sand” turning point for the Venom character within the Marvel universe. My declaration that this is the “last” great Venom story of the 1990s cuts two ways – I do sincerely enjoy this arc, but find very few redeeming qualities in the way Venom was treated in the years that follow this issue. And part of what complicates my overall feelings about ASM #375 is the fact that writer David Michelinie puts a number of ideas into motion in this issue that do Venom more harm than good over the long-term. 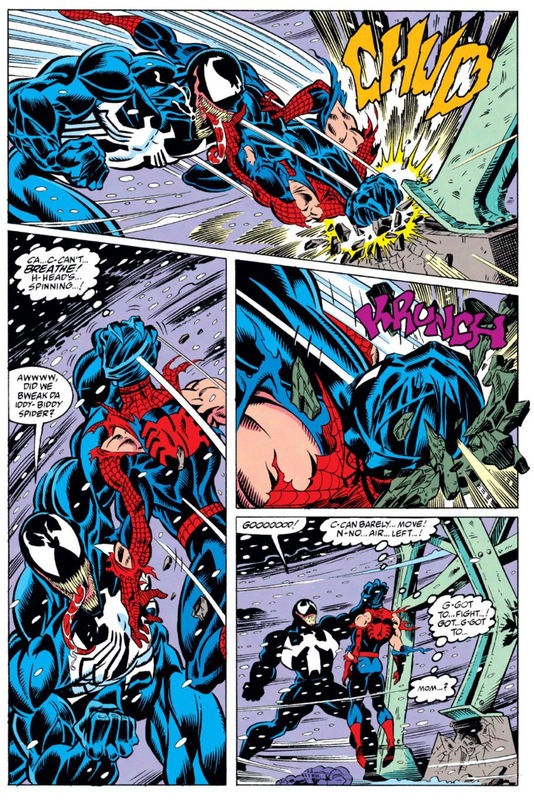 Most notably, after toying with the idea of turning Venom to the side of “good” during Michelinie/Bagley’s very first Carnage story about a year earlier, ASM #375 ends with Spider-Man and Venom making a “pact” where both characters would leave each other alone and stay out of each other’s way – effectively marking this comic as the “official” babyface turn (if I may use a wrestling term) for Eddie Brock and his alien symbiote. 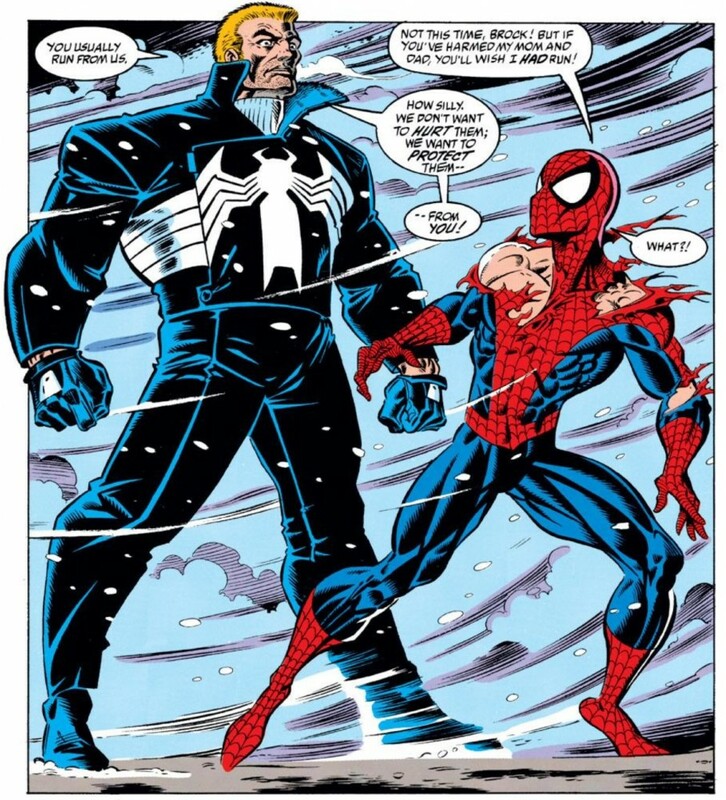 We reach this turning point for Venom/Spider-Man after Michelinie goes above and beyond in building sympathy for Brock – who in the past has demonstrated a twisted sense of “morality” that involves him murdering people if they directly or indirectly obstruct his path to Spider-Man. But Brock’s previous transgressions get glossed over here in favor of giving his origin story a little more depth. 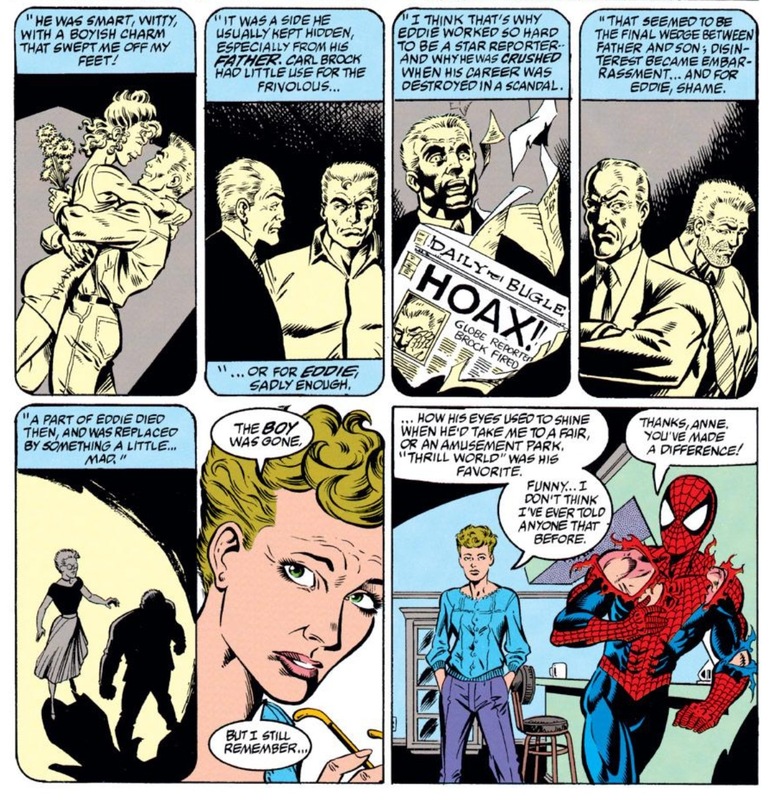 Michelinie introduces readers to Brock’s ex-wife Anne Weying, who tells Spider-Man that his mortal enemy used to be a good, loving person until he was consumed by the darkness of the symbiote. I’m never one to dismiss the idea of creating a richer back-story for a character, but Michelinie and Marvel’s motives become crystal clear by the end of the issue. It is imperative that Brock demonstrates some level of “good” behavior as it makes his eventual redemption all the more palatable. Michelinie then baits and switches us a bit with the central conflict of his story. In ASM #374, all of the tension focuses on whether or not Venom can get his hands on Peter’s long-lost parents. When that issue ends with the Parkers being kidnapped by Venom, one would think ASM #375’s drama would hinge on whether or not Spider-Man is able to find his parents before Brock does something to harm them. Instead, the reader learns very early that Brock has no intention of hurting Peter’s parents. He doesn’t even spoil Peter’s secret identity with them (despite having the perfect opening, but opting not to). To top it all off, in a move that screams unresolved childhood trauma, Venom brings the Parker’s to the “Thrill World” amusement park, a place Eddie visited as a kid. Michelinie even creates sympathy for Venom as he’s beating the crap out of Spider-Man. When Spidey confronts Venom at Thrill World, Silver Sable’s Wild Pack ambushes the villain with flamethrowers and sonic blasters. Venom initially thinks Spider-Man put them up to the attack, but thanks to the Wild Pack’s bull in a china shop ways, Spidey and Brock are finally able to see eye-to-eye. First, an out of control fire started by one of Sable’s men lets Venom act the hero and save Peter’s parents. Then, after a sonic blast weakens Venom so he’s unable to single-handedly save Anne from a falling Ferris wheel, Spidey joins his side and helps Brock save the day. Venom threatens Spider-Man one last time, before the infamous peace agreement is made. All of these plot points are designed with great calculation by Michelinie. How can anyone possibly hate Brock once this story ends? And of course it all ties-in to the launch of the Venom: Lethal Protector mini-series soon after – Venom’s first solo story where he’s a full-fledged hero. But should Venom have ever been cast as a hero or an anti-hero? 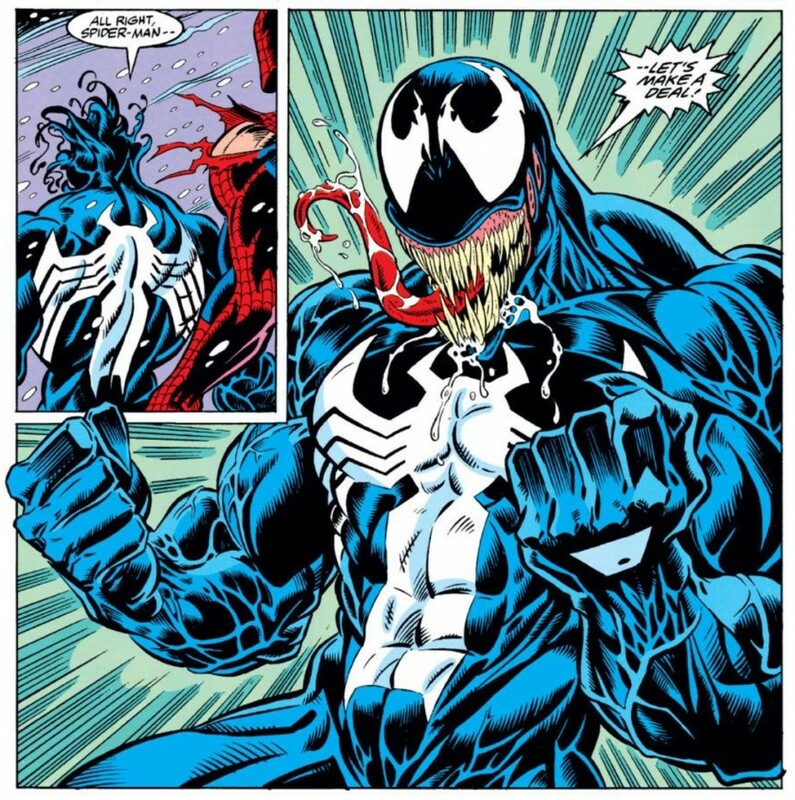 In my opinion, the character unquestionably loses his charm from this point on, especially during the remainder of the 1990s (an argument could be made that once they separated Brock from the symbiote, creators at least had new kinds of stories to tell using Venom and/or Eddie). 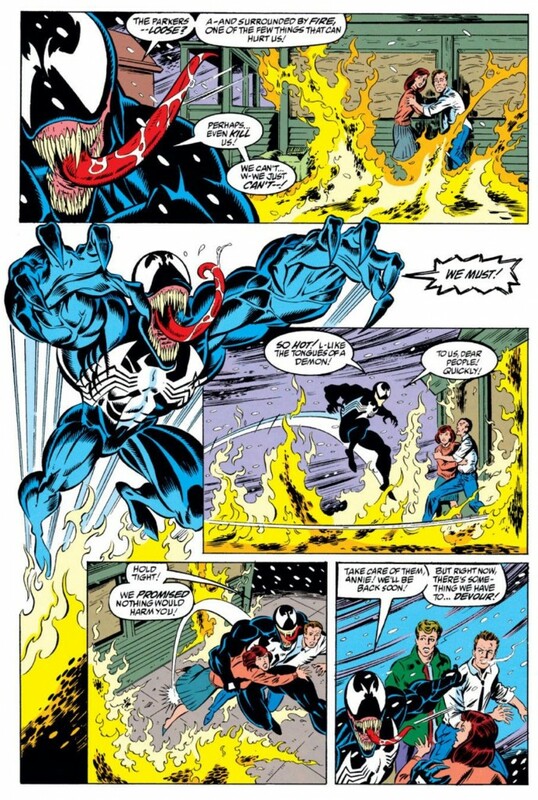 A large portion of these diminishing returns could be chalked up to lousy writing (Michelinie certainly didn’t bring his “A” game for Lethal Protector), but beyond that, ASM #374-375’s manipulations granted Marvel the license to cast Venom as a “good guy” for the indefinite future, leading to the character’s damaging overexposure. 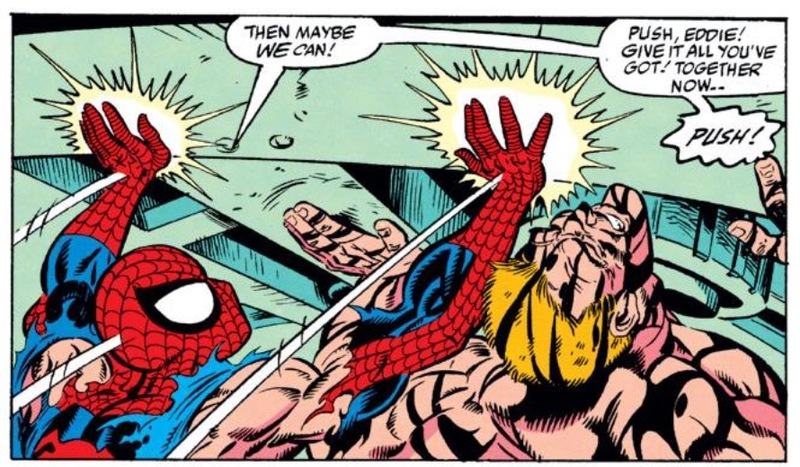 So in many ways, ASM #375 is the comic book equivalent of a pyrrhic victory. I loved this comic as a kid, and still have affection for it – and I’m sure hundreds of thousands of people picked it up just like I did in the early 90s (because of that pretty foil cover), but at what cost to a character I had once thought was one of the best villains Marvel had created since the Silver Age? Talk about a questionable legacy for a comic book. I started buying Spider-Man comics when I was about 12 or 13, around Amazing 390/Spectacular 216. Now that I look back at it, I couldn’t have picked a more agonising time to become a fan, as the titles were just warming up for two convoluted years of the clone saga. But before that storyline broke my spirit, I was always excited to pick up a new issue of ASM, as well as hunting down the classic stories in reprints. I loved the task of piecing together Spider-Man’s history bit by bit. But, living in a small town in rural Western Australia, I had to rely on the newsagent for my comics, which was hit and miss. As for back issues, they were impossible to find – the only real comic shop in the state was a three hour drive away. On one of the rare occasions I could get to the city, I managed to get to that comic shop. There, I found and bought my first back issue: ASM 375. It was a big moment for me. 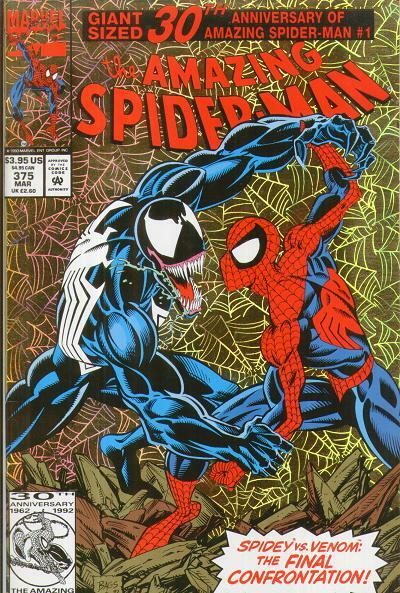 With my limited funds, this was the first ‘special’ issue I’d acquire as well as my first introduction to Venom, who was, in the parlance of the times, awesome. Reading your review took me straight back to that moment – the buzz of being a kid in the 90s who had rifled through a stack of back issues and struck gold. Or rather, gold foil. Thanks, and keep up the great work here and on your podcast. Thanks for the comment. There’s no question this was a special comic. As I’ve been hearing from a lot of people who have special memories of this one. Ahhhh the memories. Yes this book while looking at it without the rose tinted glasses is a bit troublesome. Venom never really worked as a hero for me. As a kid though to see any villain team up with the hero to save innocent lives was mindblowing. I mean would the Joker do that? Would Lex Luthor help save Superman? No those stories were cut and dry for the most part. They were stories of pure heroism vs evil psychopaths and geniuses. That’s what set Marvel apart from the rest. their villains for the most part were just flawed human beings that stuck to a path of crime and villainy simply because of circumstance, sure there was the couple of insano psychos that want to take over the world type, but they were very few. That’s what I enjoyed about this comic as a kid. The Marvel U was grey anything was possible with their characters. Thank you for this revisit to my past because like you I did scour comic shops looking for back issues because of this comic, and was awarded the coveted (if you had a father like mine) box of dads old comics full of gems like ASM 43-45, 48-49, 53-56, (classic Lee/Romita) and 143-171 (ok not so much gems but entertaining reads) and Spectacular 1-14. All of which I still have to this day. Once again this insane love for the webhead is all thanks to THIS comic. Darren, I absolutely agree with you about the “anything can happen” mantra with Marvel. I guess my only problem was did they betray the character in the process of doing “anything?” Venom worked just fine as a sociopathic antithesis to Spider-Man – he was his “venom” after all… but making him an anti-hero changed too many things about the character that made a lot of stories that followed a wasteland. Oh absolutely. In fact my problem with Marvel in the 90’s besides the usual gimmick fad was this abuse of power to generate sales, and Venom became a victim of this strategy. Much like you I never cared for the whole anti hero Venom. It never suited him or me all that well. Look back at the 1995 Marvel super specials and you’ll see Brock and Parker almost buddies as they fight off the symbiotes and Carnage. It was kind of sickening even as a child to see this. I have an obligation to comment on this post that this was my very first comic that I ever read and was the sustaining reason, through my childhood, for the love of the medium. I think I found the moral complexities of the Spider-Man/Venom relationship in this singular comic really fascinating, outside of the greater context of who these two characters were, and enough cannot be said about the artwork, which I’m looking forward to hearing your opinion on. I still cannot get enough of Bagley’s Venom. No one has ever presented the volume of the symbiote and how it wraps itself around objects and people quite like Bagley did. I found myself counting the teeth that were punched out and imagining the physical operation of the symbiote and tongue all night as a child. I read it enough that I know I’ve purchased it at least 5 times. When I finally decided that I would be collecting every issue of Spidey… this was the first issue I bought. Ah Amazing Spider-man 375. That shiny gold cover was enough to get 11 year old me to pick up his first Spider-man comic from the store my parents owned. After reading it, I talked my parents into taking me into town to the local comic shop so I could pick up #374 and any other interesting back issues I could find (and led to me becoming a Spider-man collector). Being that this was my first real exposure to Venom, it didn’t bother me as much when he became a hero, at least at first. After picking up all of the previous stories that featured Venom it became clear to me that he probably did work much better as a villain. I actually re-read “Lethal Protector” not too long ago though and it still was a good read, though the highlight for me is the art, as I am a big Mark Bagley fan and think he drew the best Venom.